Version 3.0 of DocRead introduces a new feature which, when combined with DocSurvey allows you to request that groups of users complete a survey / quiz or questionnaire without an associated document. In earlier versions of the software it has been necessary to attach a survey to a document and then assign the document (with the survey attached) to the relevant group of users. Here's how you can simply this process for the end user by creating a Survey Request. If you already have a licence for and are already using DocSurvey, then please follow the instructions below. If you are going to use DocSurvey for the first time, please follow all of the instructions in the DocSurvey installation guide found in our Documentation Center. 1) At the Site Collection level, go to Site Settings and select 'Manage Site Collection Features'. 2) Activate the 'DocSurvey Form Requests Site Collection Feature'. 3) For each site where you are using DocSurvey, go to ‘Site Actions’ then ‘Site Settings’ and under the ‘Site Actions’ menu select ‘Manage site features’ then activate the ‘DocSurvey Form Request Web Features’. 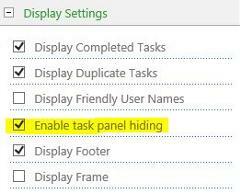 If you wish the user to be able to directly access the survey from the DocRead Web Part then you also need to edit the web part and select 'Enable task panel hiding' from the 'Display' section as shown below. Once you have activated this feature a new content folder called 'DocSurvey requests' will be created in the Site Contents page. 1. From the Site Settings menu on the site that contains the survey you created with DocSurvey, click on the DocSurvey Requests folder. 2. Click on new item. 3. Give your request a title / name and select the relevant survey from the drop down list. If you want the users to directly access the survey (as opposed to viewing the DocRead task pane first, also check the ‘hide task info’ box. 4. Add a Survey start message and comment as appropriate. 5. Select the correct group of people who need to complete the survey and set an appropriate response time in the acknowledgement period (days) box. This uses basic DocRead functionality, for more information, please refer to the DocRead Publishers guide found in our Documentation Centre. Note: Each person will need to have a DocRead licence, if you experience a licensing error please contact sales@collaboris.com including a copy of any error message received. 6. Save the data. DocRead will process and assign these Survey requests during the next scheduled task processing run.